Published by Derees & Bennett Publishing Co., Battle Creek, Mich., 1928. Cover has wear. Inside pages are nice and clean overall. Corners are bent, small tears on outer margins on some pages. 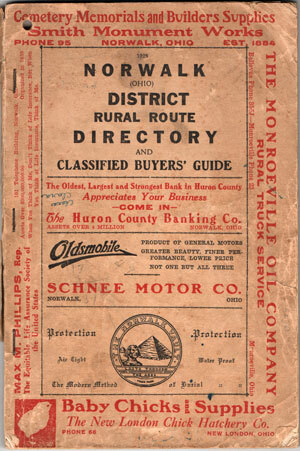 A directory of residents in the rural district of Norwalk, Huron County, Ohio. Soft cover, 136 pages. Also includes numerous business ads.